'Windows To Our Past' Auction is a fundraiser supporting the Sturgis Historical Society - The Museum At The Depot. Thirty five plus local people have turned old windows into works of art. They are on display at the Sturgis District Library. Viewing items is free. Bidding will end on Saturday September 22 at 3pm. Food Truck vendors will be downtown serving lunch from 11:30am-1pm. 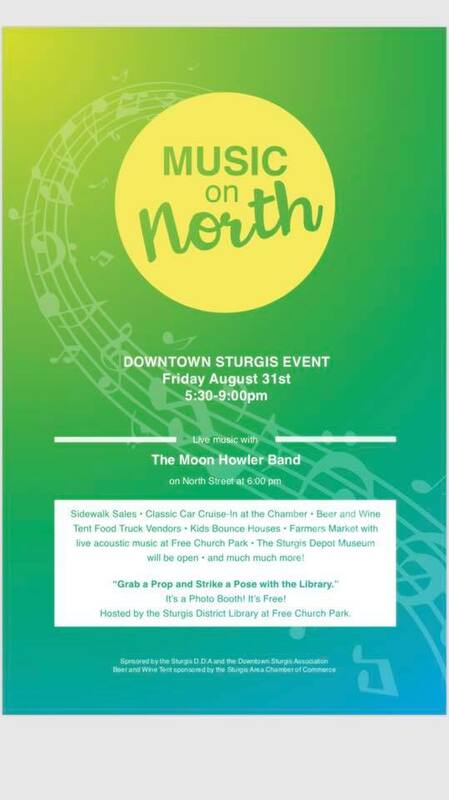 Live music with Moon Howler Band on North Street with food truck vendors, downtown sidewalk sales, "Grab a Prop and Strike a Pose with Sturgis Library" @ Free Church Park, Classic Car Cruise-In @ the Sturgis Chamber of Commerce and the Sturgis Depot Museum will be open! 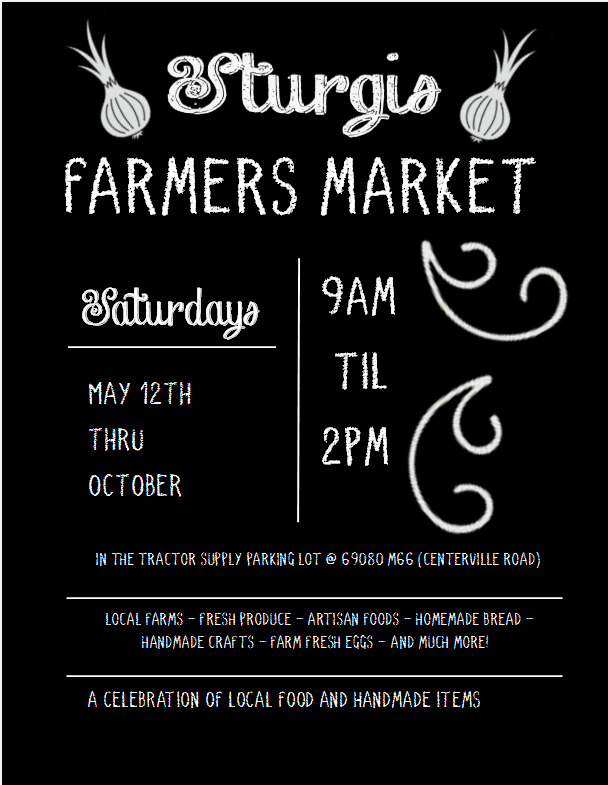 Local Produce, Baked Goods, Art, and Crafts from local producers! Responsible for guiding policy of the Doyle Community Center and advising on issues related to the City Recreation Department. Oversees the activity of these bodies established to promote development in the Sturgis area and rehabilitate and redevelop brownfield properties. 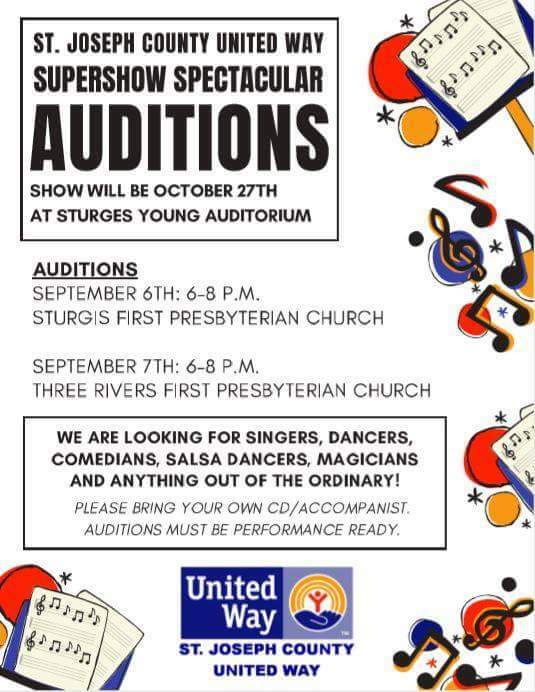 The Supershow Spectacular is a new variety show event to benefit the St. Joseph County United Way. Open tryouts for show participation. The Spectacular will be Saturday, October 27th. Additional auditions will be in THREE RIVERS from 6-8p on Friday September 7th (location to be determined). Entertainment by Honey Creek Band. 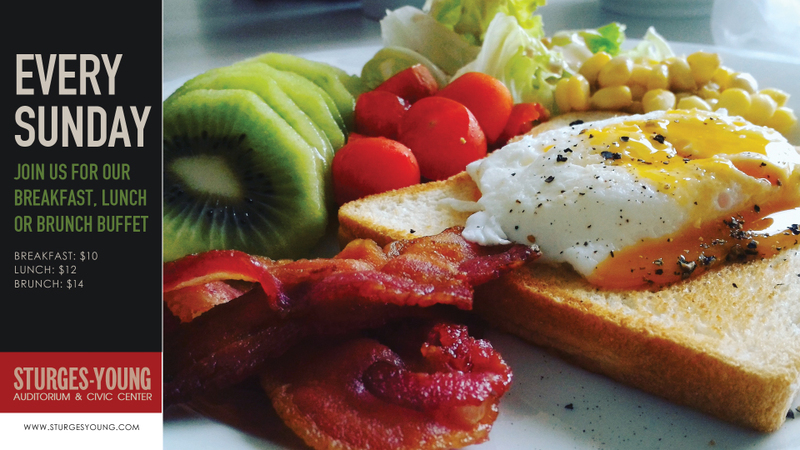 Experience cuisine from Columbia, France, Italy, Japan & Poland. Proceeds to go toward the purchase of Patient Care Beds and Electronic IV Pumps. Our fundraising events are essential in helping Sturgis Hospital maintain the highest quality health care for our community. By attending or donating to the Autumn Feast you will help ensure we can provide the most up to date technology and the latest standard of care for our patients. Responsible for guiding policy of the City's parks and cemeteries and providing recommendations on the same. Finger Lickin' Chamber Chicken Lunch! Yoder's 1/2 Chicken, Pasta Salad, Beans, Roll/Butter, Cookie Free Delivery for orders of 20 or more! Pre-order today!! Presales need to be picked up by 2:00 pm. After that time, all chicken will be sold.